When I first built the big gate … I bought a 2 ton hoist to operate it. The gate only weighs around 550 #s. However, when the head race is full of water there is a lot of hydraulic pressure on the gate. So, I used the big hoist and an old metal axle I found in the mill. I built the frame with 2 X 8 in. oak and drilled holes for the iron bar to slide into. As you can see in the photo the iron bar (solid) bent. It also cracked the oak frame slightly. 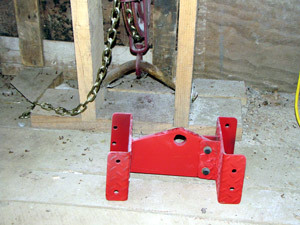 Jay Scrivhor designed and built the new piece in the photo. When it warmes up I will install it. It should support the oak and not bend like the metal bar did.